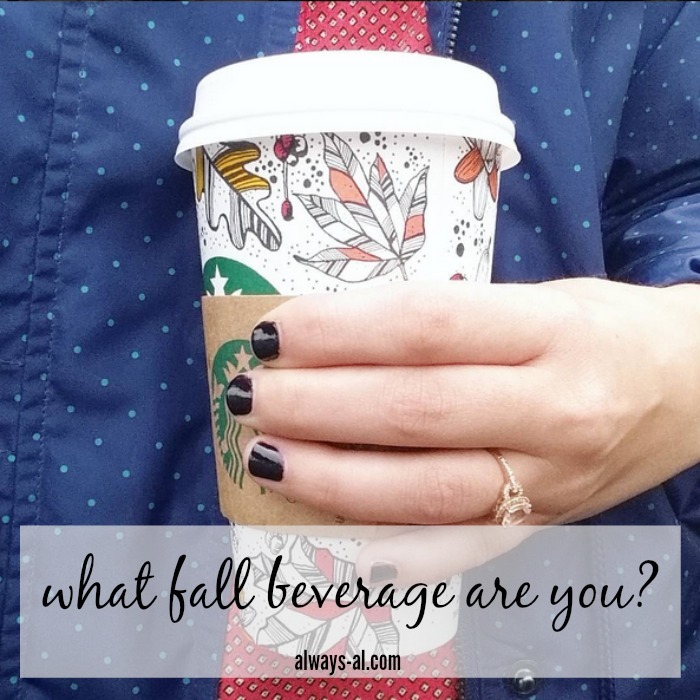 What Fall Beverage Are You? Happy Friday friends! The other day my coworkers and I were talking about what our typical fall drink orders are. We were saying how we pretty much always order the same drink, and how it fits us. Have you ever noticed how people's drinks match with their personality? Just me? I think fall is my favorite for seasonal beverages. Summer is a close second, but with all the pumpkin, apple, and cinnamon flavors present in fall drinks, it easily becomes the winner. Just for fun: what fall beverage are you? You like to think that you are original. You could just be a regular mocha, but had to take it a step further with salted caramel. You probably love to wear booties, blanket scarves and plaid. Your name might also be Alex Stacey. You are classic. You probably don't stray too far from your seasonal routine, but that's okay because if it's not broken, why fix it! Going to visit the pumpkin patch, going on a hayride, and maybe even a visit to the haunted house are the highlight of the season. You are basic and you own it. Wear those leggings with pride girl. Fall started in August for you, and as soon as you had your first sip of pumpkin coffee, you pulled out the leaf garland and cobweb decor. You have had your mantel decorated for months now, and even though fall is your favorite, you secretly can't wait until November 1 to decorate for Christmas. Le sigh. You like to live life to the max. Fall festivals, football games and pot lucks. You like to cram in every activity you can think of during the fall. Nothing is better than a beer garden at a festival! You are tailgating at the football/soccer/basketball/sports game? Yes! I hope you all have a great weekend friends!